The Metal Slug Series Action in a Nutshell! I am not sure how many people know and care for the friggin’ awesome oldschool 2D arcade run and shoot series Metal Slug but i know that Alexandre Santantonio de Lyra from Brazil and myself, Reinhold Hoffmann from Germany are two of them. Seriously the Metal Slug games were and still are awesome but its a damn pity that SNK / Playmore shrinked to a shadow of itself and some of their best series ever did not see any new parts since too many years. I would buy a HD Metal Slug Remake on day one for PSN or Steam. 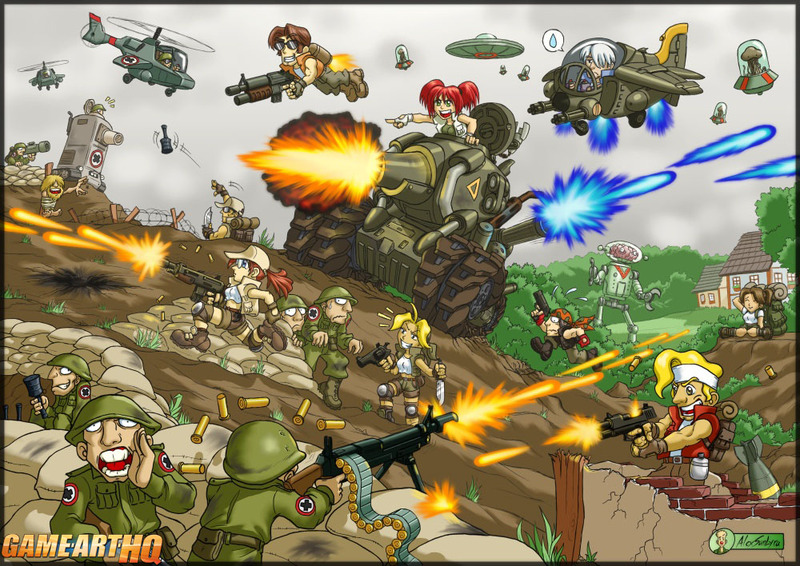 In this artwork by Alexandre you see basically the whole Metal Slug action in one big picture including all its playable main characters..excuse me now..i have to play MS Anthology!